I used to love to collect anything "Coca Cola." Then over time, my interests changed and my collection dwindled saving only a few cherished pieces, one of which is an old, vintage metal Coke sign that my cousins gave me. They were using it as a sled and thought I was weird for wanting it "just for looks." Here's another Coca Cola item I cherish. 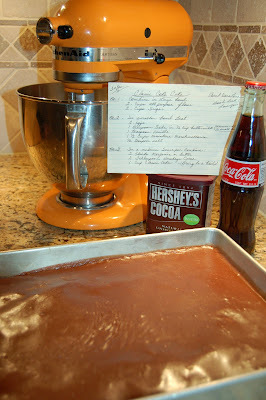 Mom's Classic Coke Cake recipe. Well, I call it Mom's recipe, because it's in her handwriting and I always remember her making it, but you can just Google Coke Cake recipe and its everywhere! This delicious cake is very easy to make. Not sure what the Coca Cola does, but it sure taste great! That cake look yummy! I'll Have to try it sometime.